“Students who test into developmental education often become frustrated with their potential to succeed in college and are unable to generate a direct path for moving to a degree-seeking status,” said Caroline Kuyumcuoglu, NVC academic program coordinator. Thanks to a $229,300 grant, many Northwest Vista College students will be able to receive supplemental instruction that includes one-on-one tutoring in courses that have been historically challenging. A check ceremony was held at the NVC campus on Sept. 21 where Texas Representative Ina Minjarez was on hand to congratulate NVC President Dr. Ric Baser, staff and faculty. NVC has found there’s a higher rate of students not passing developmental or remedial education, which are courses that prepare students for college level math, English or reading. Placing supplemental instructors in these classrooms can help reverse those trends. Studies have shown tutors or supplemental instructors in classrooms lead to higher grades for students. The $229,300 grant is from a program called the Comprehensive College Readiness and Success Models (CRSM-2018), which awards funding for projects that meet or exceed the requirements of HB 2223. The bill mandates colleges who enroll students in developmental education classes also must place students in a college-level course of the same subject concurrently, also known as co-requisite classes. Previously, students took developmental classes separately, prior to the college level course, and if they weren’t successful, they would have to take it again before moving to the college-level course. Unlike traditional supplemental instruction models, the NVC program will require supplemental instructors to attend both the developmental and college level class and enable students to receive tutoring support throughout the course. 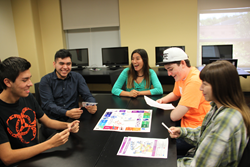 The NVC model also requires students to attend a certain number of out-of-class sessions and workshops. Kuyumcuoglu said the supplemental instruction leader is a top student or recent graduate who a student can relate to as a peer, and putting supplemental instructors in all co-requisite developmental education classes removes the stigma associated with the program being perceived as remediation. Before HB 2223, NVC made strides over the last several years to help the success rate of math students by developing a one-stop shop, Vista Central, in which first-time-in-college students receive enrollment support, career goal assessment, and includes a faculty advisement element which ensures students enroll in the appropriate college math courses. With this new grant, NVC Math will also pair developmental math and college-level math courses and use tutors in classroom to provide more help to students. Alamo Colleges – Northwest Vista College opened in 1995 with 12 students. Currently enrollment exceeds 17,000 students who are pursuing associate degrees and certificates, as well as transferring to four-year institutions. Located in Westover Hills, Northwest Vista College’s expanding agreements with business and higher education partnerships provide a wealth of opportunities for students and the community.